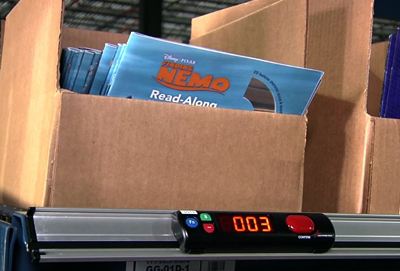 Light-directed systems don’t fit every operation, but for those with the right SKU volume, they’re ideal because they help eliminate errors, increase order picking speeds, and reduce training and development issues for new employees. How many is enough? That’s a question that sometimes depends on picking volumes. If you’re picking massive numbers of orders for a relatively small amount of SKUs, then picking systems are more justifiable. “For example,” said Dave Broadfoot, Managing Partner at Lightning pick, “distribution centers with 6,000-plus SKUs with long aisles and pallet picks might look to alternative technologies such as RF pick, Voice Pick or a batch wave pick Put to Light system. The Pareto principle is often helpful in these situations: if 20% of SKUs demand 80% of your order picking labor, consider a light-directed system. A common scenario is partial automation targeted at specific goals – a single zone, a particular aisle, a group of work cells, etc. You can add pick-to-light in specific areas to increase productivity for your most critical, high-volume product picks or work zones. By taking advantage of using multiple technologies we eliminate the use of a paper pick and improve the real-time information available to track orders in process. The ability to evolve and adapt to new configurations or changing business should be top-of-mind for any order fulfillment upgrades you consider. One of the best reasons to use pick-to-light is that the system is inherently simple, easy to learn and multilingual. Training people to use it is easier than it is to train a fast food employee. This makes the learning curve slight and return-on-investment quick. “Today’s fast food technologies simplify each presentation process, making it easier for employees to learn it and excel at performing it,” Broadfoot added. Good automation should always reduce the training curve, allow employees to perform quickly, and in a variety of roles in an operation. Pick to light lets your order picking workforce adapt quickly to new or shifting roles. Pick to light is also great for today’s multilingual labor force. You don’t have to worry about language skills, which is a concern with voice directed or paper systems. Also, when you have training or workforce turnaround problems, or use lots of temporary workers for spikes or to enhance your workforce, light picking is ideal due to its simplicity and ease of use for workers in a variety of picking situations. 5) Articulate your objectives: what do you really want from a directed picking system? These are just broad examples, and there of course must be more detailed goals backed up by an ROI analysis. These costs don’t necessarily show up in dollars and cents, but each manual transaction adds time and reduces efficiency. Once you have decided to pursue an automation project, research your potential providers for experience, references, ability to integrate to other equipment and systems, etc. There are plenty of ways to improve order fulfillment operations, and picking systems are just one. While choices are plentiful, it is difficult to understand how the application might be a good fit for your company without specific information. You should consider all of your alternatives — manual systems, light, voice and RF. Typically, pick to light is best for goods-to-person picking like carton flow, ASRS, carousels, and the like. Voice isn’t as suitable for those, and should be used mostly for static storage like shelving and bins. Light-directed systems aren’t sequential, like RF and voice terminals. With those systems, your computer system will dictate the picking order. Pick-to-light modules light activate for all pick locations simultaneously, which lets the operator pick her own path. That flexibility is believed to be superior to a more rigid system, since operators understand their picking area and can designate paths better, and in multiple directions. Compare picking enhancements: Light-Directed vs. Pick to Voice vs. RF Systems. “You can’t automate bad processes,” one of our clients once told us as we dug into his project and he realized the scope of the challenges. It is a profound truth that no amount of automation will turn around a poor picking scheme or unworkable processes. In fact, adding any type of automation is useless without comprehensive understanding of how the new system will work and what processes it replaces or modifies. These projects are often fruitful for companies because they provide an opportunity to truly analyze the operation and what each department or work team is trying to achieve. That work alone can be invaluable, as you get a better understanding of your situation. 8) Is your picking scheme suitable to automated light assistance? Most pick to light systems are zone picks. In a zone picking scheme, workers are assigned to an area where they will pick product to each passing order. Orders are typically conveyed, rolled on a cart, or perhaps an AGV or other transport method. It’s an assembly line approach that helps keep order pickers “home” in an area they know well, work daily, and can master quickly. Reduced walking means pickers aren’t as tired and commit fewer errors, while also wasting less time in transit to stock locations. Pick-to-light systems have been around since the 1980s in various forms and are used extensively and in many proven installations across a variety of industries. They have also seen costs decline the last five years or so, due to advances in technology and widespread computing. At one point, only very high-volume, large operations could afford this level of automation, but that’s not true today. They’re installed in many midsize or smaller order fulfillment facilities, and are generally considered tried-and-true technology. One of the most useful things about automation is that data that it generates. Light-directed picking systems should provide real-time data that can help you understand a particular order picking employee’s productivity, speed and accuracy. It can also help you understand which types of orders and which products are problematic. This might help you re-slot, move a particular SKU into a light-directed zone, train employees, or redesign processes. “The more information we have relating to a customer order the better decisions we can make relation to operation process, exception management and ultimately we can develop the best customer service which improves our customer relationships,” Broadfoot added. As you move through the process, information must be gathered. We can assist you with these questions. The good news is that light picking systems can be specified with new facilities or fitted into existing goods-to-person picking options (flow racks, ASRS, carousels, etc), providing you a range of options as your company grows.